In case you missed it, Understanding Insider Movements (William Carey 2015) was released a few months ago. For better or worse, now the term “IM” is guaranteed to stick around for a while. UIM is an important and impressive book. By my count, about 75% of it was previously published. But the sheer volume of the book (64 articles + appendix) is a testimony to the fact that evangelical missiology has made some positive steps forward in the last couple decades. You don’t have agree with everything in UIM (I don’t) to benefit from it. But you can read more of my thoughts here. Who are the authors in the book who oppose Insider Movements, or have raised concerns regarding Insider Movements? Fred Farrokh wrote a similar review, and I would be interested in your response to that. Readers of UIM may benefit from knowing that its editors John Travis and Harley Talman are two vocal proponents of insider movements. UIM provides no dissenting opinion in the 64 chapters, where such opinions would have been easy to obtain. Instead, concerns about insider movements are handled in a self-question and self-answer format by insider advocates themselves (for example, Chapters 3, 5 and 56). As such, Travis and Talman have missed an opportunity to answer their critics; instead, they have not included their critics in the discussion. Hi Elnwood, good to hear from you. You pose some fair questions. Here is my perspective. 1. As to authors who “oppose Insider movements,” I guess I feel like a broken record and saying there is no such thing as THE insider movement. In my look at the articles, there are around 5-7 authors who have major reservations about certain aspects of what some authors in UIM have put forward. My point is that views expressed in UIM fall on a spectrum and are far from uniform. I don’t feel that the TGC review or Farrokh’s review seem to grasp this, or else they are painting in broad strokes for political purposes (which doesn’t do the discussion any good IMO). 2. As to the charge that UIM is biased, Western, or failed include voices from critics- I find that puzzling. Critics of IM have often times created straw men arguments, or their critiques have not been very substantial or cogent, or they commit missiological fallacies that are not hard to spot. But actually, many of the articles in UIM do in fact respond to traditional positions, so it is implicit in there. Like I said, Coleman’s work (the very best traditional analysis of IM) was addressed in the appendix. That being said, UIM might have been stronger if critics voices were addressed directly, yet that could be a 679 page book in itself (and quite boring)! Additionally, indigenous MBBs (HBBs, etc.) have the same debates and differences among themselves that we are having in this discussion, so it is unfair to assume that UIM has missed an opportunity to include their (varied) voices as well (although some of their voices ARE included in UIM!). You can always find evidence from indigenous believers to support your own views (which is another missiological fallacy that both ends of the spectrum often make). Thanks for the link to the review. I will read it. I don't think Elmwood is failing to grasp anything. He doesn't say 'The Insider Movement' in his question, but 'insider movements'. Based on the editors and Table of Contents this seems more like a book about cheerleading than serious scholarship. I'm wondering if anyone could share the Table of Contents online. They don't have that feature at Amazon, unfortunately. 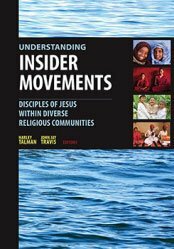 You can check out the table of contents and endorsements at https://missionbooks.org/products/detail/understanding-insider-movements . When people like Wright, Kärkkäinen, Keener, Bevens, etc enthusiastically endorse the book, you know there is some serious scholarship in it. To regard UIM as simple cheerleading would be unwise (although some articles are stronger than others, as is the case in any edited volume). The main objection that is being raised are that opposing views weren't included. Your response is is that IM opponents don't grasp the diversity of Insider Movements, and they are either ignorant or doing so for political purposes. I'm not sure what that has to do with original objection, that opposing views aren't included. Unless you're saying that, because the opposing views don't grasp the diversity of Insider movements, that their viewpoints weren't worth including? It also seems like you're doing the same thing you're accusing IM opponents of -- you're characterizing them as "created straw men arguments," "their critiques have not been very substantial or cogent," or "they commit missiological fallacies." Perhaps you don't grasp the diversity of IM opponents? Perhaps you need to listen to them and understand them better? Shouldn't you give them the same courtesy you expect from them? You also brought up the review of Doug Coleman's dissertation. I am glad the book included a response to Coleman, but the failure of actually including material from Coleman seems, again, one-sided. Most readers that try to be fair include both sides, i.e. the Perspectives reader including one article from Phil Parshall, and an article from John Travis. If the Perspectives reader decided to nix Parshall's article and just include John Travis's response to Parshall, would that seem balanced? I initially asked, "Who are the authors in the book who oppose Insider Movements, or have raised concerns regarding Insider Movements?" You mentioned "there are around 5-7 authors who have major reservations about certain aspects of what some authors in UIM have put forward." I asked "who" the authors were who had reservations, not "how many" had reservations. Could you name the 5-7 authors who had major reservations? What are those reservations? Where have they published those reservations? And where does UIM respond to those reservations? Hi Elnwood. Thank you for pointing out my hypocrisy in labeling “IM opponents” into one group. You were correct to do that, and it’s a very good correction to my sloppy thinking/writing. Thank you. I apologize for failing to answer your questions. I’ll give it another shot below, yet I’m not going to name specific authors for fear of misrepresenting someone’s view, also I also want to encourage everyone to get a copy of UIM for themselves. I’m still wanting to steer the conversation away from the binary “IM” opponent/proponent framework (apparently easier said than done ;-) ). I think we can all work together to make that a reality, but it will take people like us to help others grasp the complexity of insiderness by responding to poor book reviews on the subject, for example. I don’t know of a single person who holds to the “5 pillars” of IMs that the TGC review described. It is therefore unhelpful for the body of Christ, IMO. To the objection that “opposing views weren’t (directly?) included” – I’m still puzzled by that objection of UIM being one-sided, but if that is a suggestion that one wants to make in order to strengthen the volume, then I partially agree. However, if I want to read objections to IM then I know of other volumes to look at (i.e. Chrislam, Morton), including IJFM, St. Francis, EMQ. Personally, I don’t want/need UIM to respond to all the varied writings against the insiderness spectrum. However, I will say that many (most?) of the articles in UIM either implicitly, tangentially, or directly deal with ‘IM opponents.’ It’s right there and people will need to see it for themselves. To claim opposing views are absent is a misnomer. Also, I don’t want to name specific authors (it would take too long), but they are in there for everyone to see. For example, Bartlotti has a good article on using certain lenses for understanding how we understand the phenomenon, and I don’t think he would self-label as pro IM (whatever that means) and some of his own reservations come out. And Mark Young, president of Denver Seminary, has an article on syncretism is very helpful- yet neither is he a pro IM. Also, Barnet has an article that critiques everyone on the spectrum. Etc. I believe the point (and value) of UIM is more to the question of “how can we better understand the reality of insiderness today?”, and not “should insiderness be happening?”. So I can totally see how someone predisposed against “IM” would consider UIM to be one-sided. Yet I think the later question is tired and the missiological conversation is moving beyond it. Thank you for the humble and thoughtful response. "I don’t know of a single person who holds to the '5 pillars' of IMs that the TGC review described. It is therefore unhelpful for the body of Christ, IMO"
because I think it's an important topic to address, and I think represents the heart of the conflict about IMs. Ibrahim drew these "five major erroneous theses" from the UIM book, which was written by many authors. To be sure, not every author espouses all five erroneous theses in UIM. But all five of these have been espoused by IM proponents, and certainly there are many who espouse three or four of them. Yes, the rhetoric is harsh, and it tends to lead the reader to assume that all IM proponents are like that. But at the same time, if they truly are erroneous theses, shouldn't we be concerned about them, whether all five are being espoused by someone, or whether only three or four erroneous theses are espoused? Note: By my reckoning, Rick Brown, in his description of "Biblical Muslims" (IJFM 24:2) and his other writings, has supported all five pillars of Insider Movements. Hi Elnwood, I don’t think his “five major erroneous theses” are accurate representations of insiderness (it’s much more complex than that). They were written by someone with a predisposition against “IM” (as I tried to kindly suggest in my original response). I don’t believe anyone (including Brown) would say, “yes, that is what I believe” without wanting to add some serious nuance and clarifications. For him to say that all 5 of the theses have been “refuted” just sounds too simplistic. Furthermore, even if the original five major erroneous theses were corrected with more fairness and understanding, I don’t think they are all that ‘erroneous’ (assuming we could get to the real issues). To assume they are erroneous actually exposes some serious assumptions that need much deeper examination than is happening in certain corners of evangelical missiology these days. We need better biblical thinking on identity, revelation, ecclesiology, “religion,” and especially epistemology, and I think UIM moves in a helpful direction (but I don’t agree with everything). As I wrote above, this represents the heart of the conflict about IMs. The reason I think Ibrahim's five theses are indeed helpful is that they are five points of contention that proponents and opponents of IM should be able to dialogue about openly. Perhaps Brown would want to nuance his views on each of those five points. However, I have read what he has written on each of those five topics (I'm assuming you have too, right? ), and I found his views on each of those topics to be in error and dangerous. (This is not to cast dispersion on his character or his faith. I've met and talked with him on a few occasions and have found him to be a good, faithful Christian). I understand that you don't find those five theses to be all that 'erroneous.' But Ibrahim does find them erroneous, and I do as well. We don't "assume they are erroneous" (what did you mean by that?) any more than you "assume they are not erroneous." That is simply our conclusion based on our reasoning and what we see in Scripture. You talked about "getting to the real issues." I'm happy to discuss further with you on these five points of contention, if you are willing. But I am disheartened at the way you are relegating Ibrahim and myself and others to "certain corners of evangelical missiology," as if we are the black sheep of missiology, way outside of the mainstream in a corner somewhere, who need "deeper examination," and lack the "better biblical thinking" that UIM has. Ayman Ibrahim got his Ph.D. in Intercultural Studies from Fuller Theological Seminary, one of the largest centers of evangelical missiology, and is working on a second Ph.D. at the University of Haifa, so I don't think a lack of deeper examination or good biblical thinking is his problem. Ibrahim teaches at SBTS, one of the largest seminaries in the world, and represents the IMB, one of the largest missions board in the world, so I don't think he is outside the mainstream of evangelical missiology. Several prominent missions organizations have written position statements against Insider Movements (the IMB, PCA, SIM, the former Arab World Mission, the former Frontiers Canada, to name a few). So while Insider Movements are practically assumed in some circles of evangelical missiology, I think it is fair to say that it is not assumed at the actual missionary level, where many organizations have taken a stand against them. So again, let's not cast dispersions on each other, or make broad, sweeping statements about each other. Let's "get to the real issues"! Hi Elnwood, good to dialogue with you. I appreciate the back and forth. I really hope to meet you in person some day! I share in your respect of Ibrahim (and the organizations you mention). He’s awesome. I apologize for saying something that made you feel marginalized. However, I still don’t feel his “five pillars” approach has adequately or accurately framed the issues. So I guess we’ll just have to agree to disagree that they are “the heart of the conflict of IMs.” The issues are much more complex, and we all still have so much to learn and explore (I’m trying to speak to everyone on the spectrum, including myself), biblically, theologically, and contextually. A better framework is Bartlotti’s article in UIM (although still a bit simplistic), which is also in IJFM. Additionally, if you’re interested in exploring further, I suggest reading through the Bridging the Divide “Summary Reports” from the last five years which have tried to capture both the agreements and the disagreements in this discussion. Hi Elnwood, I am Ayman Ibrahim. I would like to connect with you by email, brother. Would you please let me know your email address? Thanks and every blessing. Amos Yong's review of UIM at IBMR April 2016: "This is not an unbiased, neutral evaluation of insider movements (IMs); at the same time, it is also not an uncritical advocate for IMs that ignores questions that have been raised over the last fifteen plus years about such phenomena. In fact, scholars like Phil Parshall and Timothy Tennant, who have raised concerns, are among the most cited and engaged in the book, even as there is an extended response to the most sustained critique so far of IMs—Doug Coleman’s A Theological Analysis of the Insider Movement Paradigm from Four Perspectives (WCIU Press, 2011). Interested readers can therefore get a full sense of the arguments against IMs and their rebuttals by IM proponents." L. D. Waterman recently published a book review as well. I'd be interested in your comments on it. In particular, I think Waterman has a response to "the missiological conversation is moving beyond ... the question of 'should insiderness be happening.'" "In any case, after five years of substantial dialogue with the editors and many of UIM’s authors, UIM felt to me like a polarizing step backward from recent years of fruitful missiological discussion." Hi Elnwood, Waterman is awesome. I really appreciate his missiology. So I was surprised that he considered UIM polarizing, yet if he considers Chrislam: How Missionaries are Promoting an Islamized Gospel (eds. Lingel, Morton & Nikides, 2012) and Insider Movements: Biblically Incredible or Incredibly Brilliant? (Morton, 2012) to be "polarizing" as well then I would say he is consistent. One thing that Chrislam and Morton do, as well as Ayman Ibrahim above, is to generalize IMs. Yet Waterman ironically says, "One of my concerns about UIM lies with the presentation of IM as a generalized construct." THIS IS MY MAIN GRIPE WITH EVERYONE IN THIS CONVERSATION and why I wrote The Complexity of Insiderness (http://muslimministry.blogspot.com/2015/09/introducing-complexity-of-insiderness.html). I'm also still a bit unclear about what is the "insider paradigm" and I didn't find it a helpful distinction. Also, note well, when we use the term "religion" or "religious" then we will have problems in this conversation. I'm also a bit leery of dealing with Islam as a coherent "entity" as I feel Waterman does in the review. I would nuance a bit more there. I further don't seem much value in calling IM a Western missiology. I have heard it from non-Westerners just as often. Yet I do share some of his concerns about the book and various chapters. Waterman did a good job in pointing to a couple places of sloppy reasoning and theology. It was a much better review that previous reviews, although I did feel Pocock's review in IJFM was fair as well.